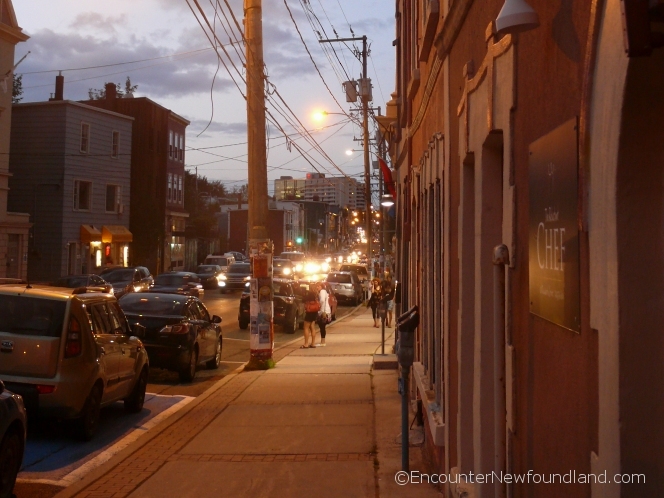 Arriving in St. John’s is a bit like stepping into a different reality. The salt sea air, the laid-back pace, the unusual accent—there’s an immediate and startling sense of different here that slows you down and catches you up at the same time. To begin with, St. John’s is said to be the friendliest of Canada’s capitol cities, and it’s no myth. 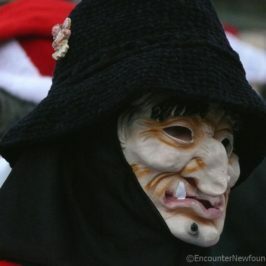 In what other urban center do passers by make eye contact, smile and wish complete strangers a good day, after all? 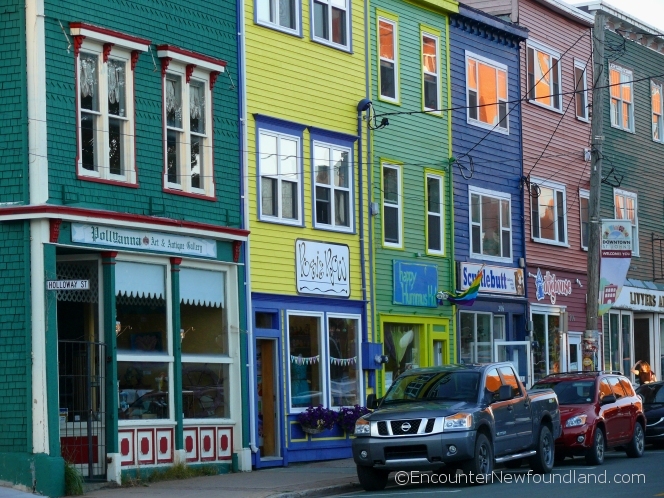 St. John’s is quite possibly the most multi-hued city in Canada. Brightly painted Jellybean Row houses and stores abound. While denizens of the world’s foggiest city are fond of saying that the colors help them find their way home, the cheerful, vibrant edifices actually had their beginnings in a brilliant downtown revitalization plan of the 70s. 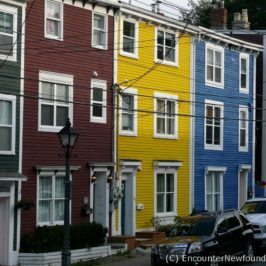 That brilliance spread, and today, strolling in downtown St. John’s is a little like walking through a colorful storybook village. 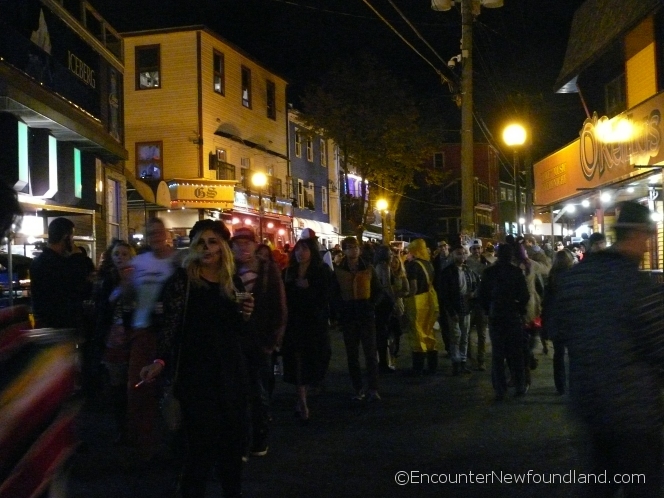 Every city has a party strip, but none quite so characterful and dedicated as the lively George Street in St. John’s’ historic downtown. Creatively lit public houses of all descriptions vie for space within the two traffic-free city blocks reserved for revelers, a space said to contain more drinking establishments per square foot than any other street in North America. And on George Street, the party doesn’t end until 4 AM. 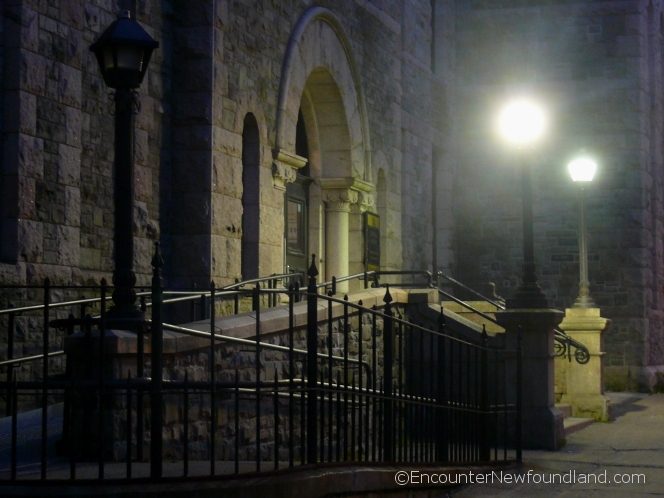 St. John’s is the oldest city in North America, and the architecture of its early days is still very much in evidence. Though the city is undeniably modern in its offerings, its well-preserved structures of yesteryear give a real sense that the present is time-sharing with the past. Like a living time capsule, Old St. John’s retains the charm of a bygone era, when homes sported elegant mansard roofs and great stone facades cast Gothic shadows in the softer glow of gaslight. 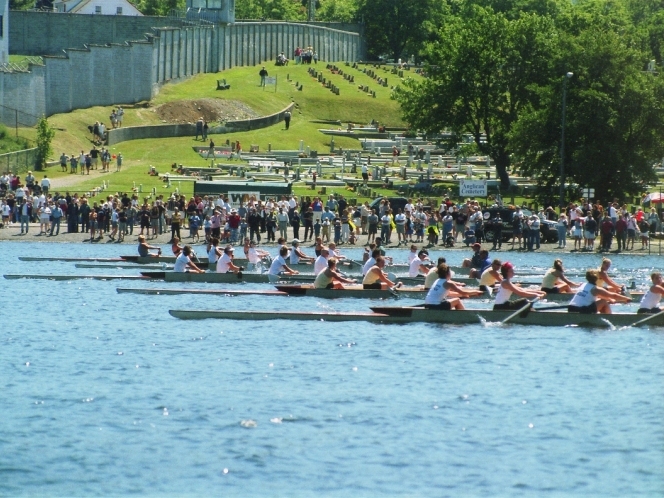 All cities have their civic holidays, but Regatta Day in St. John’s is the only one where the actual day of the much anticipated mid-summer break—a.k.a., “The Largest Garden Party in the World”—depends solely upon the weather. 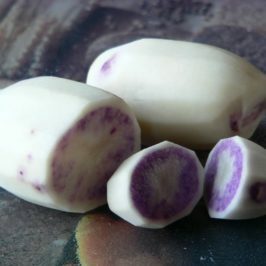 If it’s sunny and the wind is right, the race, and the holiday, are on; if it’s not, it’s business as usual. Locals call it Regatta Roulette because there’s always a chance they’ll have to work with a hangover, if Mother Nature decides not to cooperate. There’s a free concert series in this city that few residents miss out on. It’s a symphony performed entirely on ships’ horns, and for anyone within a 12 mile radius, there’s no opting out. 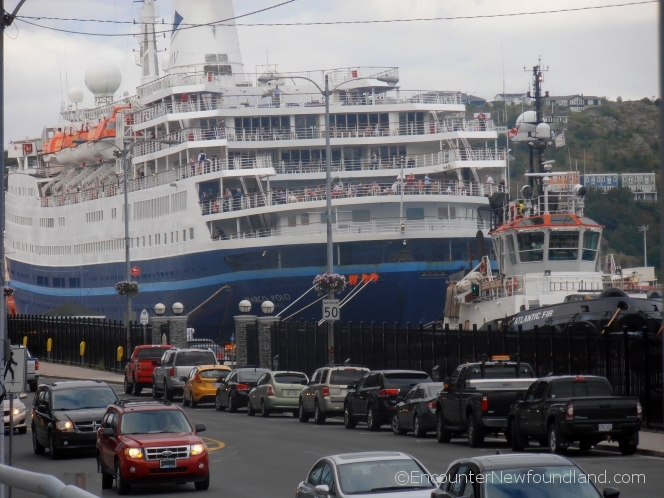 St. John’s is a busy international sea port, and on any given day it’s crowded with massive seagoing vessels. During the summer they form an orchestra on the water, serenading the city with their unique and robust performances. The ships are all but parked at the curb on Water St., so there’s room for everyone who wants the front row experience. 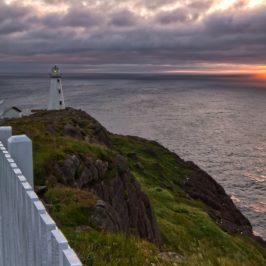 Unlike so many urban centers, St. John’s isn’t big on smokestacks or skyscrapers, and fresh ocean breezes ventilate its thoroughfares, so despite the bustle of traffic in the streets, that familiar city smell is refreshingly absent, even in the downtown core. 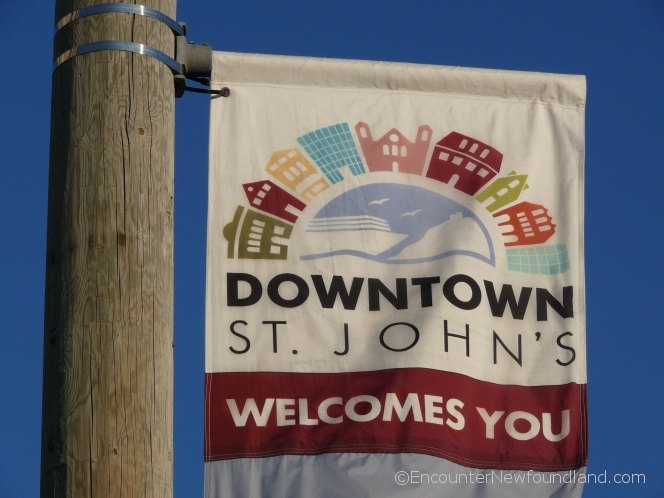 That’s not to say that St. John’s is scent free, however; the enticing aroma of fish and chips, the tang of the salt water, the yeasty fragrance of ale brewing—a medley of scents meld into a vivid and not unpleasant olfactory experience. The city smells as interesting as it looks.